Today is "National Chip and Dip Day "
My fave is Dean's French onion dip and regular ruffle chips. I've tried homemade and this is still my favorite. What kind of dip and chips do you like? To assemble your Journal Jar, print the colorful journal prompts pages. Cut apart each printed strip, and fold it so that the colored graphics are folded to the outside, with the journal assignment on the inside. Or, as I did, I wrote out my own prompts. 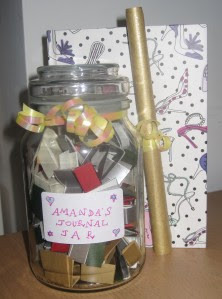 Fill the jar with journal slips, and attach a free printable gift tag. Add a cute journal and pen for a great gift idea. I use me journal jar every day. Mine is simpler than the one in the photo. I just use a plain jar with no decoration, but after seeing hers, I think I will make mine more colorful. You can find journal prompts all over the internet. Here are some of my fave spots.